THE INSIDIOUSNESS OF THE UNILATERAL "SOUTHERN" NASAL AERODYNAMICS. SNORING WHEN NASAL RESPIRATION IS SAVED. 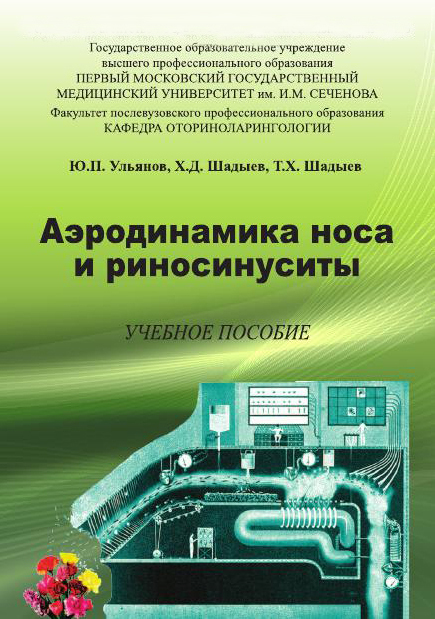 This textbook «NASAL AERODYNAMICS and RHINOSINUSITISES» is recommended by Educational-methodical Association on Medical and Pharmaceutical derivation of universities in Russia as the Manual textbook for experts in ENT illnesses professional skillss improvement as a good application and in polyclinical conditions (outpatience practice). In the given textbook, with the help of the author's technique was the first to research airflows in nasal passages, that has allowed to conduct the deep pathophysiological analysis of features nasal aerodynamics, which plays a leading role in the development of seasonal ACUTE RESPIRATORY DISEASE (ARD), with stagnant sinusitises, by the way RHINOSINUSITISES (RS). The proposed rapid method of determining violations of a nasal aerodynamics considerably accelerates their diagnostics, facilitates the selection of pathogenetic therapy and helps develop pathogenesis-based preventive care (prophylaxis). Designed as therapeutic ways of seasonal protection from violations of nasal aerodynamics and surgical ways of renovation of protective properties of aerodynamics of a nose, the application which one allows more successfully to treat and to notify seasonal ARD with RS. The new techniques are protected by the Russian patents. 16. Since the main cause of the night snoring is blocking of the reserve respiratory nasal airway at SVA because of chronic congestive MS, physiological edema cavernous bodies and protective rhinedema of the inferior nasal passage, which leads to the mouth breathing, pathogenetic treatments snoring during sleep should be recognized as forced airing sinuses or surgical reconstruction the NVA from the SVA. Ulyanov Y.P., Sadyev H.D., Sadyev T.H. Department of Otorhinolaryngology for postgraduate professional education of the First Moscow State Medical University of Sechenov. The prevalence of snoring, according to different authors, reaches among the active part of the population over 30%, and after 60 years, more than 60%, disturbing the others and lead to night attacks suffocation in the form of obstructive sleep apnea in 7% of snoring, which leads to oxygen starvation of the cardiovascular system, with the defeat of the heart and brain, in this connection, eliminating snoring has great social importance. The most reasonable cause snoring is considered mouth breathing at night - in a dream, when the jet of air inspired by mouth leads to vibration of the soft palate and this case, to get rid of snoring is enough to restore nasal respiration. However, today there are no common opinion about the reasons and mechanism of snoring, especially in the absence of explicit difficulties with nasal respiration. Since the very base of the functional features of the nasal respiration is its aerodynamics, when studying the pathogenesis of origin snoring we used the latest data on development of the nasal aerodynamics. The presence in the nose, two parallel respiratory structures and confirmed our study of aerodynamics nose for the last 30 years, among which were the main sinuses with their nasal passages, and already functioning in the newborn and ensuring the maximum warming and humidifying the defenseless during sleep respiratory tract, but due to the rigidity of designs, they were sufficient only at minimum needs in a respiration, as during sleep. And in the waking state as during exercise, when the bandwidth of the main respiratory tract becomes not enough, for an additional input of air through the nose reflexively open the inferior and middle nasal passages, performing function of the "reserve" respiratory tract. At the same time, for the basic functionality of the respiratory tract,, according to the laws of nasal aerodynamics, need blockade of the "reserve" respiratory tract, for what already exists inferior turbinate, covering the inferior nasal passage along its entire length, as well as physiologically programmed blood filling the cavernous bodies of the inferior and the middle nasal passages, which we looked at as "physiological edema ". It should also be noted that the middle nasal passage is the most constant, because functioning as in newborns and adults, but the inferior nasal passage is as a dynamic, forming only two-year, later developed to such an extent that it becomes the major regulator of the redirection of the main air flow redirection between the inferior and superiors nasal passages, therefore, its functional status and was given a special attention. Since the air flow on the "reserve" respiratory tract, in the waking state goes past the sinuses, it is warmed and moistened not enough that creates the danger of overloading the adjacent respiratory tract, which is successfully maintained through appropriate activation of the protective properties of the organism. Protection of the respiratory tract in the waking state help and nasal sinuses as a result, even at 20 degrees of frost inspired air is warmed up to plus 25 degrees, which successfully protects against seasonal ARD, in connection with which this type of nasal aerodynamics, we were treated like the Northern Variant of nasal Aerodynamics (NVA). And when the main air flow entering through the inferior nasal passage is its excessive overloading to the development of posttraumatic inflammation, leading to seasonal ARD. Since this type of nasal aerodynamics is most suitable for the more southern latitudes warm climate of the Mediterranean, it began to be regarded as the Southern Variant of nasal Aerodynamics (SVA). But conditions of the Mediterranean is not fully make up for the violation of nasal aerodynamics in the SVA, because the stagnation in the sinuses, which forms in them chronic sinusitis, which in humid climates only exacerbated. As a result, in a state of sleep, the SVA, when the "reserve" respiratory tract is on a blocking "physiological edema", and superior nasal passages with the sinuses already blocked stagnant sinusitis, - go to mouth breathing, it becomes necessary, that confirms the dependence of the origin of snoring in such cases due to of the mouth breathing. However, by matching the data of different authors, it appeared that only 75 % of snoring have a clear nasal respiration difficulties, leading to the mouth, and 25% snoring nasal breathing is uncomplicated and therefore, as if to disprove the dependence of the snoring from the mouth breath, that was the reason for examining as the causes of snoring is the specific structure of the nasopharynx and pharynx. To read more to understand this contradiction, we conducted the additional clinical examination 200 adults snoring patients in the waking state, which the NVA has not been found, that confirmed the presence of snoring in this patient group as a result of the mouth respiration inherent to the SVA. In this case it turns out that the mouth respiration during sleep, with the SVA, and contribute, as a protective swelling of the inferior nasal passage because of overload and perfusion of the mucous membranes of the nose as a result of the horizontal position, which together form the so pronounced complex edema, that the transition to mouth respiration becomes quite natural, although in the waking state, nasal respiration in these patients seemed effective, because the lower nasal passage was open. It also appeared that among 32% found that snoring patients with the SVA, even complex edema of the inferior nasal passage could not provide its blockade in the sleep state, as because of the overly broad inferior nasal passage, and as a result of gross atrophy of the mucous membrane, already not able to swell, which retains the possibility of night nasal respiration through the inferior nasal passage and, therefore, as would be liberated from the need to move on the mouth respiration. Since this group of patients differed the greatest congestion of the inferior nasal passage, especially during sleep, for removal of its consequences, in the form of hyperirrigation, was undertaken by the local anti-inflammatory and protective therapy. As a result of a two week course of such therapy, as expected, all noted the weakening of snoring and even his temporary disappearance of 52%, and after the reconstruction of the NVA snoring disappeared completely, which confirmed our assumption about the reflex mechanism for transition in a dream on respiration through the mouth due to hyperirrigation of the inferior nasal passage. Thus, we must admit that it is quite obvious hyperirrigation the lower nasal passage from overloading during sleep with the SVA naturally lead to reflex transition to mouth respiration, even while maintaining the patency of the inferior nasal passage, which confirms the dependence of snoring and in this group of patients also from mouth respiration. Consequently, the main cause of snoring should recognize respiration through the mouth due to violations of the nasal aerodynamics on the SVA, but the outpouring of the features of the structure of the nasopharynx and pharynx of the snoring should be considered as the effects of the mouth respiration, leading to snoring.